Beautiful! A pesonal favorite of mine! I love this three intial monogram. Please enter your information here. Please include letter placement for initials and also color choice. 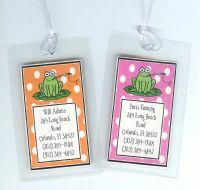 Personalize this tag anyway you wish on the front and the back! 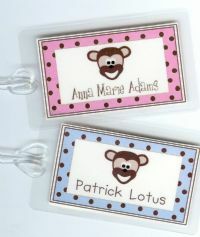 Please enter all wording for the front and the back of your tag here! So Cute! The initial of your choice is printed on the front. The back can be the same as the front or can be printed with any info you provide. 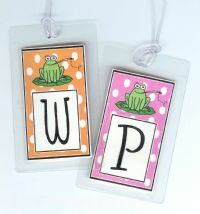 Please enter the initial and wording for your bag tag here. 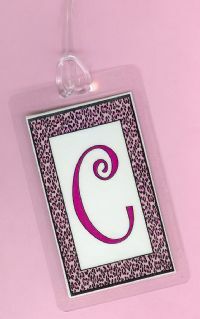 The front can be personalized with the name or initials of your choice. 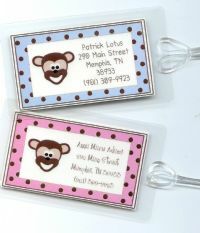 The back can be the same as the front or have your contact information printed. The front can be personalized with the name of your choice. The back can be the same as the front or have your contact information printed. Your choice of pink or brown. The front can be personalized with the letter of your choice. The back can be the same as the front or have your contact information printed. Your choice of colors!